Making The Most of Naptime : Brownie Pie - with Peanut Butter Cups! Brownie Pie - with Peanut Butter Cups! So this morning on my Facebook feed it was full of people declaring "Happy Pi Day". I was like, what?? Pi day? You mean Pie day?? Oh wait. It's March 14. As in 3.14. Pi. But wait. It's March 14, 2015. or 3.1415. Wow. Apparently this is a big deal to those passionate about Pi. I'm NOT passionate about Pi. But I'm definitely passionate about PIE! So what a perfect day to bake a pie! Brownie pie?! Yes please! I tweaked a recipe I found on Pinterest, here as found on A Communal Table. I do have a tried and true brownie recipe that I love, but it's made all in one pot on the stove, and I'm sure that will be the subject of a future blog post. I liked that this one was done all in the mixer...no melting butter or solid chocolate, no separate bowls! 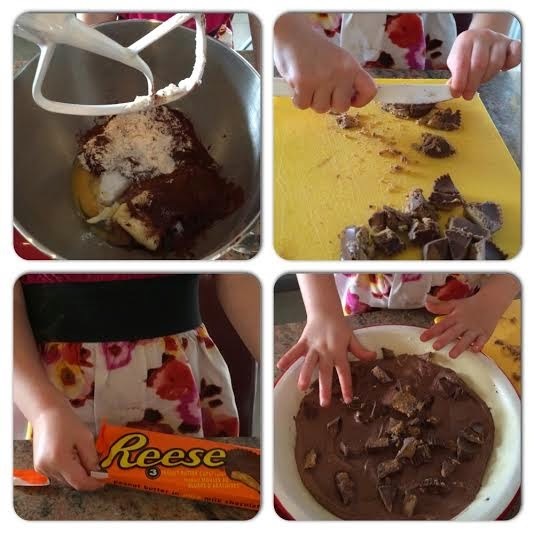 This recipe is a really easy one for my daughter to help with. Put all ingredients except the peanut butter cups in the bowl of your stand mixer. Beat on low until combined, and then scrape the sides and bottom of the bowl down. Continue beating for FOUR minutes. The recipe creator stresses this and I can see why! The batter becomes this delightful creamy concoction that you just can't believe until you see it. Mmmmm.....Perhaps all this air whipped in replaces the baking powder or soda in this recipe? Whatever the reason, it's an awesome whipped consistency. Pour about 3/4 of the batter into a greased 9 inch pie plate....you'll need to spread it with a spatula. Top with the peanut butter cups, and then cover with the remaining batter. Bake in a preheated 350 degree oven for 30 minutes. The top will be dry but JUST set. It will sink down slightly when you remove from the oven, and that's ok. If you overbake this it will be dry and crusty on the outside. 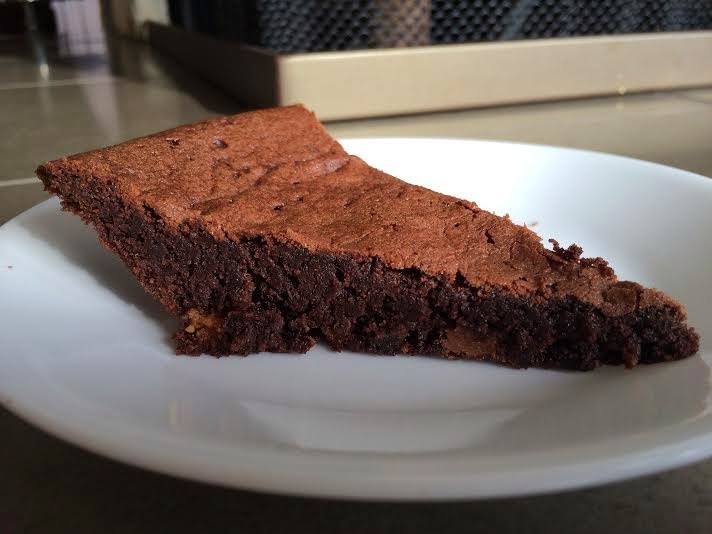 Pulling it out just at the non-jiggly phase gives you a nice fudgy brownie.